When you entrust your health to a company, you might expect them to take that seriously. Health is not something that can be brushed off or ignored, yet that’s exactly what some “health” companies do. 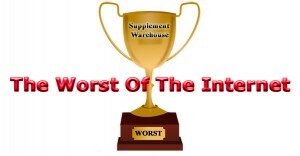 One such company is called Supplement Warehouse, the very first winner of our “worst of the internet” award. “Legitimate” may be left to interpretation. Well, unfortunately I didn’t “know who I was doing business with”. Had I known, I would have never given them my money. But now you can learn from my mistake. I’ve been asked if taking a single multivitamin per day is enough for most people. The answer is…maybe. The answer is vague because each of us are different. It depends on your age, lifestyle, gender, level of health and medications that may be taking. You might need supplements of certain, specific vitamins that are lacking in your diet, or you might need to compensate for those lacking in your body. You might need more of a vitamin to combat a certain difficulty you might be having. This is not a cop-out to the original question. Taking a multivitamin is the least you should be doing. Why? Taking a multivitamin, and specific vitamin supplements help you get energy for proper metabolism. Read moreIs One Multivitamin Supplement Per Day Enough?